All Web addresses mentioned were functional as of 8-12-16. From the Cumberland Gap to the Atlantic Ocean, this is Virginia Water Radio for the week of August 15, 2016. This week, that clatter of calls introduces a family of birds known for forked tails, tricky flying, and insect feeding. Have a listen for about 40 seconds to sounds from three species, and see if you can guess this bird family. And here’s a hint: if you get the right answer, you won’t have to do THIS to a bitter pill or your pride. If you guessed swallows, you’re right! You heard a Bank Swallow, Cliff Swallow, and Tree Swallow, and the episode’s opening sound was a colony of Bank Swallows. 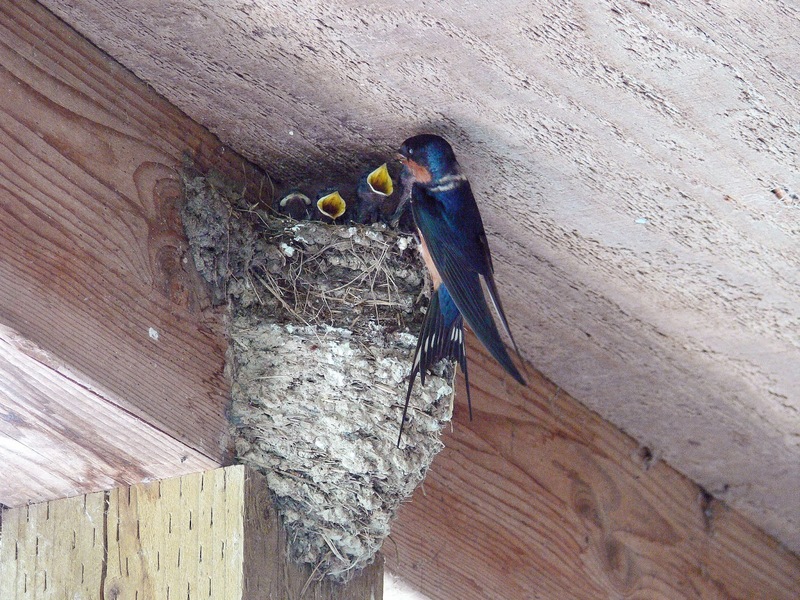 Out of eight North American species of swallows, six species are summer breeders in Virginia: the three you heard, plus the Northern Rough-winged Swallow, the Purple Martin, and—perhaps the most familiar—the Barn Swallow, known for building mud nests in human structures. As a group, swallows are distinctive for their habit of flying fast over land or water to catch insects in their wide-opening beaks. Flying swallows can also be seen dipping their beaks into water to drink. 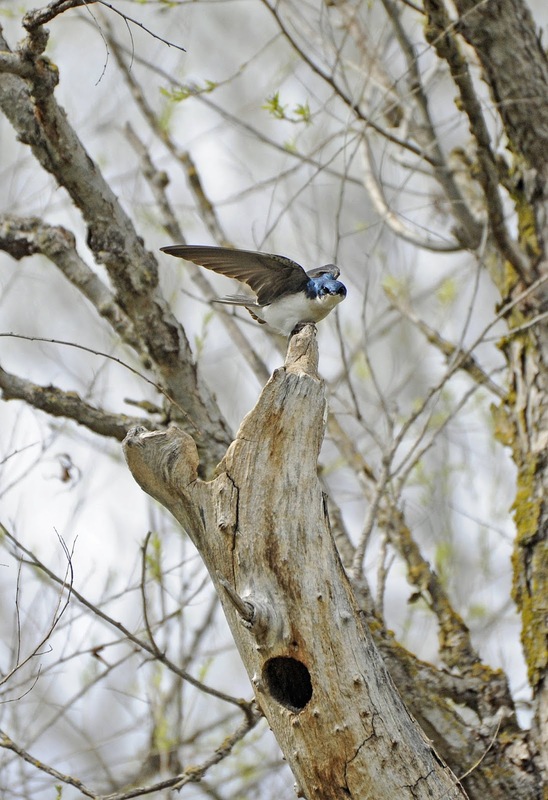 Water habitats are important for several swallow species, such as Bank Swallows and Northern Rough-winged Swallows nesting in streambanks, and Cliff Swallows building mud nests near rivers, lakes, or wetlands. Several swallow species are also noted for gathering in large groups, either in nesting colonies, migrating flocks, or non-breeding roosting flocks. Swallows are a dynamic part of Virginia’s summer air-space; look for these insect-eating aerialists near water, meadows, barns, bridges, and bird boxes. Thanks to the Macaulay Library at the Cornell Lab of Ornithology for permission to use this week’s sounds, and we close with the sound of a Cliff Swallow colony, recorded in 2006 along the Kanuti River in Alaska. Cliff Swallow colony, catalog number 130281 – recorded by Michael J. Andersen and Gerrit Vyn, June 2006, in Yukon-Koyukuk County, Alaska. Thanks to Matthew Young of the Macaulay Library for his help in providing the sound files used in this episode. Tree Swallow in William L. Finley National Wildlife Refuge in Oregon, March 2009. Photo by George Gentry, made available for public use by the U.S. Fish and Wildlife Service's National Digital Library, online at http://digitalmedia.fws.gov. Barn Swallow in Oregon, June 2012. Photo by Lee Karney, made available for public use by the U.S. Fish and Wildlife Service's National Digital Library, online at http://digitalmedia.fws.gov. Following are some excerpts from the VDGIF’s/Fish and Wildlife Information Service entries on Life History for the six swallows that breed in Virginia. Washington Department of Fish and Wildlife, “Living with Swallows,” online at http://wdfw.wa.gov/living/swallows.html.